"I fish! Fishing is my life! I fish for something every month of the year." Well,I had a fishy weekend, and I am happy! But today I am going to continue the fishiness with trying out a new bass lure. Stan Fagerstrom'sMack lure, called "Stan's Spin"! It is so pretty! I hope I know what to do with a bass lure though, and I am so afraid of losing it! As soon as I get my computer work done, I am going to put my rod in my car with my dog and go on a lake hunt. I love it! The crowds of Memorial day are gone... Usually on this weekend I hibernate because of the fishing traffic, but this time, I actually fished, and it wasn't that crowded! It was really nice on the lake Saturday morning. Perfect bass weather today, not to sunny, not too cold. Think I'll hurry up and fish! For some strange reasonthe sturgeon bite is off on the lower Columbia. Maybe because of colder water temps from the melt of snow? Who knows, but it sure was hot when I was out there, and the days preceding. I think I will fish Cullaby today for bass, take a walk around the lake and look out for a good spot. Then I'll run over to Smith and then to Crabapple, behind Coffenbury. Wish me luck! Oh yeah, I am going to scan a pic of my two beautiful boys with 4 limits of trout to post today also! I'll put them on my fish pics page soon! By the way, there are small hatchery grade Smolt in Coffenbury lake that we caught occasionally Saturday. They were released as excess, too big, or too small and they don't want these fish migrating. Is this a good idea? The main goal in releasing these Smolt are as food for the bass. But are these Smolt actually competing for the baby bass food, or do they feed the larger bass? I'm not sure I like them taking away the food from the baby bass. I sure would like a way to actually measure the success of this program. Somehow, I just don't like it. Well, I have decided to start playing the piano in restaurants again for a bit. Big decision. I stopped doing it because I got so tired of the night life. I had done it all my life, or since I was 17. I cut down about a year ago and then quit. But here I am again. So Friday and Saturday night, if you are out in Astoria, come by and visit me at The Cafe Uniontown! Remember, if I know you and don't recognize you, it is because I can't see you in the dim light! I am visually impaired a bit, so stick you head right up there and say, 'HEY Jennie! It's ME!" Please don't get drunk and ask me to play Misty!!! Luckily, I don't have to play the late night hours. Just the dinner hour, 6 to 9:30 or so, thus avoiding the wilder set! Which brings me to the fact that on the weekends I play, I will not be fishing at all! WAH!!!!! But I have to do what I have to do! And that is make some money! I can fish on the weekdays so it's not all that bad, and someday I am going to buy a G loomis rod.... Or a whole dang set of them! The discussion board is up again, it has been down, so post, people! POST! Please???? Ran out to Cullaby Lake today to throw around my Stan's Spin. It is a bass lure, put out by Mack that Stan Fagerstrom put his name on. I threw it around, and out and in, back and fourth, retrieved fast, retrieved slow. It sure is pretty, but I personally didn't do anything today. That is no indication, good or bad of the lure, however. I think it was not good weather, and I am not a good bass fisher. Besides that, after I threw that around, I got out my panfish gear, and tried a white jig for crappie, and then a bobber and worm. NADA. nada bite, nada wiggle, nada movement. It was so beautiful though. After I tried the long dock, I packed up my micro rod and reel, and some worms and took off down the trail around the lake, and tried some spots along the way. At one point, I heard a huge sploosh. I think it was a fish! Do bass jump? Duhhh... I don't know! Sure woke me up to the possibilities though! And me without my Stan's Spin! It was a perfectly bassy-looking spot, with lots of tree stumps and undergrowth. what are you trying to say, Kitty? Purina not doing it these days? Oh, I put up the boy's trout pic on the Fishing pics page! Sometimes I dream of having a lake all to myself. I remember feeling like I had one when I lived on Smith Lake. When things got too hectic, or even when they weren't, I would walk across the street, through the heavily wooded and covered field. It had no trails, because I always chose a new path, watching for deep holes, and sometimes surprising a deer as I would come out behind some towering Cedar trees. I would fill my pockets with wild huckleberries on the way, so I would have something to munch on. The dock was all battered and broken, and very dangerous as it had been years since it had been regularly used.. I had to pull boards out of the water to patch dangerous separations in the structure, and each year it got worse, and each year there was less of a chance I would meet someone there. The lily pads and cover was thick, wild and free to grow on the lake, and sometimes I would bring along my heavy sturgeon rod with 30 lb. test and drag it through the cover, clearing a spot to fish. Most often I would just sit there, and not catch anything, but sometimes, I would catch huge blue gills the size of my hand, and giggle and put them back. It was so fun! Sometimes I would lay on my stomach and hold a hook and worm in my hand and put it through the holes in the dock and catch them by hand! I think that they were so unaccustomed to people, that they had no fear! I kind of hated to catch them, and ruin their innocent outlook on life, but I couldn't help myself! It would get very cold and windy down there, and I couldn't for the life of me explain why I stayed, even though I had many fishless days. I just felt so removed from life and stress there. I would shiver, and still stay, be soaking wet with rain, and still stay. It was kind of like the days when I was a kid, and the hours would pass like minutes as we would go down to the creek, and build dams, or build rafts. Water has a way of stealing time from me always has, and always will. I need to write about this today as I have had a very stressful, busy week, and it helps to go there in my mind.As I finish this how I wish I could rise from my computer, walk out the door and start across the road to my lake. Luckily, I can still be there in my memories. Hey! It's fishing days for me! It's yucky pouring down rain, with a chance of lightening, but who cares? Iv got time to fish! I think I'll fish small, trout, bass, lake fishing, something no stress and fun. I'm so excited! My house is clean, my work is caught up, I feel like I worked hard all weekend, and I can just fish!!! This weekend at the cafe was fun, saw a lot of people I haven't seen in a while, but playing the piano for three hours sure does make you tired. Since I hadn't played in a while, I got the pre performance jitters, which is silly, because it is a very friendly house, but none the less, there I was, stressed out! I love it when children come in, because they love my playing and they keep me busy playing songs from musicals they know. Anyway, I'm excited about my couple of days to fish! Off to fix up my tackle! Froze out at Coffenbury after 4 trout. Brr! But I was all by myself! No one else is as stupid as I am, to stand out in the pouring down rain and hail for trout-lets, but for the life of me, I couldn't capture the last one! Had to catch them for my Aunt and Uncle who love them. Off to bass now... Hee hee! Where do I start? Lots of news for all of ifish. I was tired of the discussion board being down a lot so I decided to try one myself. I don't know that the quality will be much better, but at least I can administer it more personally. It is posted here if you want to try it out. I will leave the other one up for now. I am not sure how to take the valuable information off of the other board, but I think I will turn all of that into a readers tips and tricks page. I would however, appreciate you all testing it for me, so I can get an idea how it all works, and what I need to do to maintain it properly. Please post? Help the girl out! Annnnd leave some handy tips and tricks and late breaking fishing news! YES! I got a video in the mail from Stan Fagerstrom, and it is so excellent that I would like to offer it for sale to all of the readers here. I have not created the page for it yet, but e mail me if you are interested. It covers every kind of casting you can dream of, and some I hadn't! It helped my casting ability immediately, as I tried some of the tips out today with my new little bait casting reel. I went out to Crabapple Lake this morning for bass. Didn't catch any, but I was able to cast much better using some of Stan's advice. I will have the page up as soon as I get some more information from the Master Caster himself, Stan Fagerstrom! Yesterday I totally got rained out, but had a nice relaxing day watching Stan's video. And believe me, you can watch it over and over! I'm going to hook my TV up outside in the back yard, and practice! The charters and guides out on the Columbia are doing pretty well, having to work for their limits, but receiving them by quitting time. Oh! Check out what Amy Hamel caught on the Santiam! I just had to post it! Her smile just grabs me! I want one!!!!!!! at the N.F. Nehalem Hatchery! Lyster's Tackle, Safeway, Wheeler Marina, and Seacoast Construction. Keep a tight line JW- Nehalem Hatchery. Anyone out there familiar with computer problems, and how badly they can raz you, will sympathize with me! Things are getting better here, though. I totally crashed yesterday. I do that to computers! I am very hard on these machines! In fact, I tried my hardest yesterday to break just about everything! Just one of those days... I rolled up my electric windows on my trout rod. SNAP! Ughhh.... What an ugly sound, especially because I had gotten a lecture, the very day before on what can happen when I haul around rods like that when kids and dogs are prevalent! It wasn't one of my better rods, though, so it wasn't as bad as it could have been. I sure learned my lesson though! I just had a rough day all around yesterday. Today is going to be great! The sun is shining, and after I take my dog for a walk, and teach three piano lessons, and complete a web page job, I may have time to take my kids fishing! One of the things that does make me smile today, is that I have these beautiful goldfinches at my feeders lately! I love them! Happy fishing for the weekend, I will update my three lakes now! I knew yesterday was going to be a great day... and wow, was it! Not only did I have so many Goldfinches at my feeders that it looked almost scary, I mean there must have been 8 on each of my little tube feeders, 2 on each of the perches! They are so beautiful! But the most excellent part of my day still makes me smile, and I may be smiling still this time next year. The mailman came around noon with a plastic tube.Whatever could be in a plastic fishing rod tube? I was so excited opening it that I made the mailman do it because I was afraid I'd cut myself! He just shook his head and couldn't believe his eyes, and neither could I! I was so thrilled! It is the absolute most beautiful rod I have ever owned, and I spent the day walking it around the house trying to find a good soft safe place for it! "Bass don't always do anything!" Meaning they are a very unpredictable and always challenging fish. I think that is what attracts me to bass. The thought that I am out there on the bass water and I never know what will happen. Something silly that I do on accident just may produce a lunker! There is always the chance! And if I hone my skills and study this book, I may just be able to do something right and catch them more often! Oh, by the way, please support Ifish and welcome our sponsor, Bigfishtackle.com! Off to Nedonna Lake to help my kids and other children to catch fish. I feel like this is contributing to our future! I personally think that if you teach a child to fish he will grow up to be a finer citizen and keep him/her out of trouble!Byeeee! Len Self just mentioned the fishing on the Columbia is really taking off. Best with shrimp and anchovies. Better book your trip now! And hey, I am going out on the ocean opener with Captain Mark Charlton on July 19th for salmon. This should be and has been predicted by many to be one of the greatest salmon seasons we have had since 1989. I remember those days! I was out there! And then it just died! But this year, I am hoping to relive memories of summers past, by having a whole bunch of salmon bbqs! If I were you, I would book a trip now, because I have talked to many guides and charters who are near capacity, and I was darn lucky to get a trip going out on the opener. I can't wait! I piled my two boys and two of their friends into my little red subaru and took off down the coast to Nedonna Pond. What a neat deal! They had little rods and closed face spinning reels for all of the kids! They just had a blast, with free pop, free cookies, free tackle and bait and FISH! I was a little nervous as I have been known to kind of push fishing on my kids with not always great response, but this time they all had so much fun, and on the way home my youngest was inquiring about taking a bus to a local lake with a friend to go fishing.."Can I Mom?" Now that makes me happy! Anyway, It was a beautiful warm day! I saw some real little ones just shout for joy when they got a fish. This really is what it is all about. This little boy of about 4 had all of the volunteers rooting him on when he had a fish on, and he had the darndest time trying to reel it in with everyone coaching him! When he finally landed it, the shriek of joy was so contagious that it was the highlight of the day! I am so glad that I went! By the way, did I tell you I have a G Loomis rod? HEE HEE! Have a great day! Think I could talk the boys into going fishing after church? For all it's worth, I talked to Joe at the N.F. hatchery yesterday about the smolt in Coffenbury Lake. He said they are surplus silvers and as soon as the water in the lake heats up to 75 degrees or so, no salmonids could possibly exist there. So I guess they would rather put them in the lake then bury them. The Goldfinch (es) are still feeding at my feeders. I have to fill both feeders daily! I probably have 7 pair of them, and yesterday I had some red headed little finches. I think they are finches of some sort. Anyone know what they are? All I could come up with in my book are purple finches. They are rose colored on the top and body. Cute little guys. June 15th 1999 5 A.M. I'm going Sturgeon fishing on the Columbia... Look out Sturgeon! Wheeeee! Whoo hoo! I'm on a sturgeon high and I can barely move my arm! We went out to the stink flats (What an awful name, who named it that???) on the Columbia where all of the boats were dotted along the shore line like little bobbing toy boats. Anchored in about 9 feet of water, with a strong outgoing tide pulling at our gear. We needed a sign that said "Please keep off the grass" as each time we reeled in we would have tons of it on the line. But hey, we got a nice 50 inch sturgeon right away! I thought, Oh gee, that's nice. Jim caught a keeper! And we visited a little more as we watched our rods, and bingo! There goes Jim again! He handed the rod to me, and by golly I haven't felt that much strength in a fish in a long time! I screamed and hollered as the line zipped through the water! I thought, My Gosh, this fish HAS to be 9 feet! I was so excited! We left the anchor on a buoy and chased him down the bay. Wheeeeee! It went all around the boat, nearly in the prop, over Jims head! Whoops! I took his hat off with my line! (sorry Captain!) In between hoots and hollers I finally saw the fish! Oh.... he was beautiful, but definitely a questionable oversize. What a HUGE head! We boated him, and over to Len Self. Seems we weren't prepared for oversized... Jim had notched his boat for under legal, but no over 60 measurements!! So we cut a piece of line the size of the fish and handed it to Len, and Len told us it was 61 1/2! SHOOT! But we remeasured, and honestly, I had done it wrong. It was just legal! And sure enough at the docks, after a kind of worried trip in with the fish, yes, he was 59 and a little over 3/4!!! YES!! So now again I have a fridge full of wonderful Sturgeon! What a day! Now I can work! I needed that so bad! What a rush! O.K. now back to work..... Or should I go bass fishing? No, I have to work! "I thank thee God for most this amazing day; for the leaping greenly spirits of trees and a blue true dream of sky, and for everything which is natural which is infinite which is yes." Doesn't that just knock you out??? I just love that part of it! The rest is great, but that particular part of this writing will live in my memory forever, and it comes out when I feel so overcome by nature on a day like my fishing day in July. In fact, it comes out many times when I am fishing! O.K, I'll stop now. Maybe I am tired and rambling. I worked hard today, and now it is time to quit. Just had to share the story! Just a quick observation. The discussion board gets many visits a day, but no one seems to want to post anything, and this really disappoints and confuses me! Everyone wanted a discussion board, and I tried very hard to get one going. Is there a problem with it? Please write me and tell me your thoughts, as I really want to get a good one up and running. Looks like I am spending the weekend at the Seaside Convention Center at the Digital Arts Convention. I wonder if I should bring my new G Loomis rod. Think there is any chance I could catch anything out of the Necanicum? Maybe! The Convention Center is right there on the river! Wah! Brings a new meaning to mixing business and pleasure. I will be there handing out peoples phone numbers put to music. I will have my keyboard, and it's kind of an ad ploy, but way back when I used to play the piano in bars and restaurants I used to memorize phone numbers by assigning them to the 8 tones of the major scale. Thus their phone numbers would be a melody, which is far easier for me to remember. Hard to explain, but it works for me. Anyway, I hope all of you weekend fishing people have a blast. The amount of sturgeon being caught overwhelms me. Iv heard of boats bringing in 50 and more fish. Jumbo sandshrimp seems to be the key. The lakes are doing well, Coffenbury will be restocked the weekend of the 28th. I wish I were fishing! Looks like things are so hot on the Columbia that if you aren't there, you will be sorry! Jim Erickson called me and told me that he had two oversize on, one about 10 and one 12, broke a rod, and came home with two beautiful keepers. Captain Mark Charlton has a few new things to say on his page about the quota being predicted the biggest since 1989 and that they are expecting a big run of Chinook this year. I posted the rest on the Charlton Charters page. Just had to catch you up! Night! Someday, when I grow up, if I grow up, I'm going to have a place on a river, or a lake, or heck, it could even be a overgrown mud puddle! But I want to have a place near enough to the water that I can sit down and throw a line into the water and let time pass slowly. After the day has gone, after the phone has rung too many times, after Iv taught many piano lessons, after Iv hugged and attempted to help my kids with their lives. A place to unwind. I can imagine a warm summer evening in my future, with nothing on my mind but how beautiful the world can be, and no sound of sirens coming from the city, and no cars on the road, just the sounds of birds foraging for food at dusk, my chickens settling in for the night, and an occasional fish jumping in the water. The kind of evening that takes me back to the clock of childhood summer days, where time forgets to tick, no schedule, and every evening lasts a lifetime..... OK, I'm a dreamer! I have had a busy week, and every night when I am ready to quit, I have had this thought haunt me! Several times I thought of packing up the kids to go to Sunset Lake campground and set up for catfishing and campfiring for the night, but work plans for the next day prohibited it. Life is so short, and I have come to a very deliberate decision. I would rather be poor this summer, and have time to do these things with my kids than to be so busy that life passes me by. After all, being busy is expensive! When I am this busy, I have to buy dinner for the kids, rather than take the time to cook. I have to drive all over, burning up gas. I have to pay for the kids to go to movies, etc to keep them entertained, rather than sit with them and play a long game of Monopoly, or take them fishing, or go build a fort in the sand. I am also much more short tempered with them. So, there you have it. Can I keep this promise? I don't know. Life is an ongoing challenge to balance what is necessary and what is desired. All I know is that when I go, I want to know memories of spending long, relaxed periods of time with my kids, rather than a rushed, hurried life to gain enough money to buy them the best roller blades! I am going to start today. I am going fishing! Day one of my decision to be more relaxed and not work so hard went well. I actually made money and had time with the kids! Now that is ideal! I spent time with my gear, and found some nifty safe places for my better rods, and a very special safe place for my new G Loomis. I didn't go fishing, but the kids and I had a great time putting up a raw cotton bundle for the Goldfinches to pick at for nesting, and we watched them take it to where they are nesting! Then we made a cake for the kid's Dad for Father's Day, and made it into the shape of a face with a crown on it. Then decorated it with candy for the eyes and the jewels on the crown. They will take it to him today. After making a great dinner with them, we went for a penny walk. Ever done that? We flip a coin at each intersection. Heads we go right, tails we go left. It was raining so we took umbrellas and it was so fun! We smelled all the roses and flowers in the neighborhood and then started judging which house would win the "Great smell Contest"! Then we came home, made a "Great Smell Certificate" on the computer with roses on it, and we are going to leave it on their front door with a bouquet from our house! Fun, fun, fun! Today I am going to try fly fishing. I am going to go down the coast with a friend and hit some local streams. I am a little nervous, because I really don't know how to fly fish well, and he does. Oh well... here goes the chuck and duck! I have to learn sometime! The kid's are off to their Dads for a couple days, so I am going to get some serious fishing done. I may also get to go up the Columbia and fish for Summer steelhead and bass, etc. After a busy week, I am really looking forward to this! Byeeeee! Why am I making hot chocolate and building a fire? Because it is June on the North Coast of Oregon. Oh well, I am as happy as a clam. My work is caught up, I can fish for a while, and things are just good all over! "The Steelheader's Reference Guide", by Eldon C. Ladd! How fun! I can't wait! This is great for today...Hot chocolate, a great new book, and some fishing later! I will write about the book as soon as I read it! You can get a copy by looking up the title on Amazon.com, Barnes and Noble.com, or pick one up at GI Joes. The neighbors think I'm strange. Just because Iv been casting out in the road all morning. Sometimes they drive by and I am whipping flies about. Sometimes, like this morning, I had a salad bowl out on the sidewalk, and I on the opposite side with my casting reel and new G Looms trying to land the flat weight perfectly in the bowl. Yeah, ha! The closest I could come was like 2 feet, but I will get better. I am getting better. It's my method of meditation! (Ohmmmm zip zip zip, crash!) So, the neighbors think I'm strange. So what? At least they leave me alone. At least they don't come over to borrow a cup of sugar or a table for there garage sale! The crazy women with the fishing habit. Actually, my neighbors are all very tolerable, and we get along very well. It's just me, being embarrassed. We have great times in the summer, throw neighborhood outdoor parties, and even have the police block off our road for the occasion! This year though, I will have a new game for the kids at those parties. The casting game! I bet before long I will have all the kids in the neighborhood lined up with me! I am going to go out and "lure" them into this right now! If I can't be fishing, if I can't live near a body of water, I will cast in the road. "Sorry you didn't catch anything..." my friend would sarcastically utter as I met her for lunch and I was in a bad mood.It used to be that way. I was so bent on catching fish rather than just enjoying fishing. I didn't really realize it, but if I didn't catch a fish, I would be grouchy! Now when I fish, I fish for the time away, for the beauty of my surroundings, for the peace it gives me, and if I catch a fish, it's a big plus! I take my kids fishing, and if it is not red hot they get bored. I can understand that. I would, and probably did feel the same. 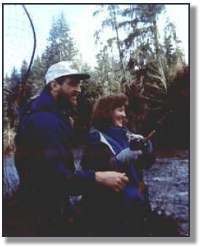 Although some of my best memories are of playing on the rocks when I got bored fishing steelhead with my Dad. I think you come to some kind of keen awareness of things in general somewhere along the line. You learn to appreciate things that you once totally overlooked. You learn to return to a place where you were when you were a child, where everything is clean and new and innocent. Just as I think that some people are dead because they were hurt by a first love and never healed, they kind of live life dead, and it is so sad to see. But you can wake up! You can learn to live and love and see as a child, totally open and unafraid. Take that part of you along next time you go fishing, and take a look around at things that you have seen through those eyes so many times, and yet did not see. Take a look at people you are around and have been accustomed to, and yet did not appreciate. Look, love, learn, see....fish for the first time! I was watching the 5 o'clock news last night and they were showing pictures of Portland traffic trying to push through a deluge of rain on the major hiways. "Hah!" I said, as I looked outside. No rain for us! So, I packed the kids in the car with a picture in my mind of them giggling, and addicting them with the thrill of catching blue gill after blue gill out on the docks at Cullaby Lake. Me, with my new G Loomis rod, introducing it to it's first fight with a bass. Let's Go! Got in the car, off to get worms, and then to the lake. Still no rain. It was a bit blustery, and I noticed my youngest in only a T shirt and jeans. Poor planning, I thought... Am I still responsible for David not wearing a coat? I mean, after all he is almost 11! Out on the dock, I got everyone rigged up, and David is ready. Hmmmm he is shivering. Bad news... Oh well... O.K, Andrew is in, looking good. I grabbed my precious rod and reel, and David is tucking his arms in his shirt, raindrops begin to fall. Whimper... NO! Tie on a lure.. quick! I am beginning to feel hopeless, like a clock is ticking... Nervous about the impending closure of this trip, I have the rod in my hand... Cast over to the most likely spot for a nice bass.... Darn! The rain! It's raining! David is looking less than comfortable. Andrew says... Mommmmmmm! David is colddddd!!! Grrr. I retrieve a bare lure. End of trip. In two minutes we were in the car, the rain blowing sideways in a gail. This is summer in June. Tis the season to be freezin. Home to hot chocolate and a movie. Summer... Every year I begin this season with a 'can do' attitude. But sometimes.... sometimes I sure miss the fact that they are in school and I can fish! I miss getting up at 5 to get all my web work done by 10, and I rush out to find my fish. Then I am home when they get home from school, with a hug and a kiss, and a fish! Then I teach piano lessons as they do their homework, and afterwards we all cook dinner. It really is quite perfect. I could just leave them home alone while I fish, because I would have waited out that rainstorm had I been alone. I would have fished either through it or after the deluge. Rain is a part of fishing. By the time we got home it had quit raining. But I know in my heart that when they are gone from home, I will be glad that I sacrificed this time during the summer to stay with them, whether we bake cookies, or just hang out. Tell me I'm right. Tell me there will be fish come September. Until then, I will live off of memories, I will write about it, I will receive letters from all of you, and smile. I will sneak out when I can, when they are at the movies, or swimming... I will again be aquainted with all things fishy and scaly, and wet. What's better, and sometimes worse, than fishing with someone you really admire? I mean someone who is a very good fishermen, who's piscatorial knowledge far outweighs yours, and who knows every little detail, every single knot ever tied, every good hole on a river. A fishing mentor... you get the idea. I first fished with Milton Fisher after I saw his pic in S.T.S. I had gone through a rough time in my life, and decided I needed to do something fun for me. I saved up my money and booked a trip on the North Fork Nehalem with him. Don't get me wrong, he knows his stuff, but I wasn't really nervous. The only thing I did terribly wrong was when we stopped for lunch on an island in the river, and I decided to skip a rock in the still water we were going to fish next. (Oops! Bye Fishies..) I was fine though, and caught fish. I listened intently to what he had to offer, and applied it to my later fishing. Then I met Jim Erickson, and I fished well with him also. I was nervous at first. He gave me videos of T.V. shows that he had guided on, and told who's who stories of celebrity people he had fished with. He was very patient, and taught me how to cast pretty well with a bait casting reel. I was a little shy at first, but ended up fishing with Jim often, and we have become good friends. I still love to fish with Jim. He makes me laugh, and although he still offers criticism, I can take it, knowing that I need this information! Then Jim brought along Bill Hedlund on a drift down the Nehalem. I was very impressed with his knowledge, and the way he cared for his gear. Somehow, though, I was so nervous fishing around him, that I couldn't do anything right! I fished with Bill on the North Fork with Jim, and it went O.K, although I felt a little uneasy. Then I fished for Jacks on the Claskanie with Bill, and there were no fish that day, so I was fine! The next day I fished with Bill, we decided to drift down the lower North Fork with Jim. I had just taken up a serious effort to learn to cast well with my new ambassadeur 5601C, and I was not accustomed to the reel, let alone an expert at casting reels at all! Believe me, I had put off learning to use one for years! So, here we are in a raft, all three of us, and I am trying to cast with this dang backlashing monster. Jim was rowing and Bill and I were up front, close enough for him to watch my every move. How I hooked my hook to my reel when we needed to pull up. (I did it wrong, of course), how I tied an egg loop, (wrong again, but I know how now! Thanks Bill!!!). Anyway, you get the idea, I was a nervous wreck. We'd stop occasionally, and Bill would wander down the bank and leave me with Jim. Jim would coach me on casting, and before you knew it, I was casting alright. I even caught a steelie with Bill out of sight. Don't get me wrong, Bill's advice on casting helped me learn to cast as well as Jim's did. In fact the magic words that helped me the most came from Bill. "Lob it!" Now that may not help everyone, but that did it for me. It took the snap out of my wrist, and sent my lure flying gracefully up in the sky much more successfully than before. His presence just made me more shaky at first. That day, as I saw Bill wading back to the boat, my casting became spastic, nervous in his presence, and my corkie was in the trees behind me, or before me, or backlashed and tangled worse than when my brother let one of those wound up rubber band airplane propellers off in my hair. I was terribly frustrated. A time came in that particular trip to quickly pull up, and put the rods in a place where they wouldn't get messed up from the brush we were coming up on. I did a quick hook up...(remember he told me I had hooked it in the wrong place?) and I set my rod in between us on the boat, hanging tight. Well.... I hate to say this.. Someday I will be able to laugh about this...but not yet, and I don't foresee the day.. My sharp gamakatsu hook hooked him in his custom waders.................................ughhhhh. I couldn't speak. I couldn't even apologize. I was paralyzed in disappointment in myself and a feeling of utmost disgust and total failure. All of these things and more. Hot tears formed slowly underneath my sun glasses, and I was as rigid, sorry, and helpless as I have ever felt in my life. It is a terrible feeling to so much want approval from someone, and fail so totally and miserably. I can fish around Bill now, and relax, and have a good time! I can cast pretty well also! He actually has helped me immensely in my fishing pursuits, and I could listen to him talk about fishing for hours. My kingdom for his knowledge. I feel so lucky to fish with these people. So lucky to listen to them, and lucky that they have put up with this girl that loves fishing so much, yet just isn't an expert no matter how hard I try! I want to fish with Stan Fagerstrom someday. But I can just see it now. I can play Beethoven just great until I have to play for Steinway. I think if I fished with Stan, I would probably hook Stan's nose. I got up at the break of dawn this morning, that would be about 4:30, and was out clamming on the beach by Fort Stevens. It was a lot of fun, not real good though. The boys and I had a really nice time though, and we are going tomorrow also. Coffenbury should be stocked as of today with the bigger trout. That is what I heard, not the gospel truth! I'll let you know for a fact as soon as I am aware. Where is the sun? What is the sun? I've never been away from IFISH for more than a couple of days, and here I am taking off for a week to Black Butte with my entire family. It will be loads of fun, however there will be little or no fishing... Can I do this? I guess there is the Metolius River.. and me with little experience fly fishing! Now is the time I wish I had a lap top! No, it is good to get away from a computer once and a while, and I love the wild life at Black Butte. I will be picking the contest winner for **** tomorrow. I can't wait! I have many entries so it will be fun. I am going to have my children choose the winner from a big jar I have full of names and e mail addresses. How fun! Can I enter? No! The kids wanted to enter also, but I said NO! I am going fishing for Steelhead on the Columbia tomorrow morning. Should be fun, and very beautiful up the river a ways. Putting in around Brownsmead. I had a wonderful clam dinner last night. The clamming was not red hot, but it was sure fun. I get so excited when I grab one and being out on the beach is something I don't do often enough. Coffenbury is stocked with larger trout so now is the time. I will let you all in on tomorrow's winner for the contest, so if you haven't entered and want your chance, sign up today! It is nice that people are leaving fishing reports on the discussion board. Please continue to do so. There are questions on the board that I am sure some of you could answer. Could you try? Off to teach, and then out to Coffenbury with the kids. I want some of those larger trout! Yes!